The boys got snowshoes for Christmas this year. I was a bit worried because we didn't have snow. It's been a crazy weather year. Made it home from our holiday journeys to.... SNOW! This left us with a great excuse to leave the "Operation Holiday Disaster Clean Up" at home and head to the woods for a bit. I love escaping the chaos. I'd like to make the suggestion that you all just take a step out and get lost in your loved ones lives, even for a few minutes. Make sure to take your camera. These are the moments we all too often forget. I don't know about you, but this time of year always seems to bring the "sickness". Our littlest has been running a fever for the last few days. This inevitably leads to constant neediness which can be frustrating at times. You know the time you'd like to empty the dishwasher, take a 2 minute shower, paint your nails, or update your blog. It's okay though, they won't need you for ever. All too soon you'll be the one begging for their attention. The older two are taking full advantage of the snow. 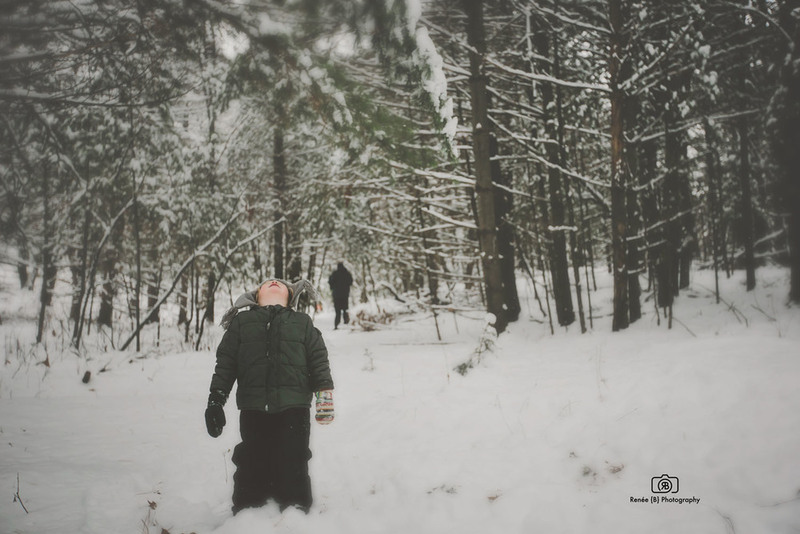 New snowshoes, sleds in hand and a woods full of treasures. They are the best at adventure and making the most of these cold dark days of winter.